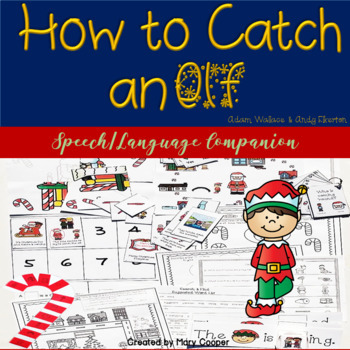 Just about everything an elementary school-based SLP (or Special Ed Teacher) could need in a speech/language book companion is included in this packet. Only 6 pages require color printing and 2 pages have an option of color or blackline printing. 15 Comprehension Questions with 2 picture choices if needed. 8 Yes/No Questions that correspond to the comprehension questions. Negation Worksheet for comprehension. Answer Key is included. What Doesn’t Belong Worksheet. The student circles the object from a field of 4 that does not belong. For an expanded activity, have the student explain why it doesn’t belong. Answer Key is included. Sequencing. 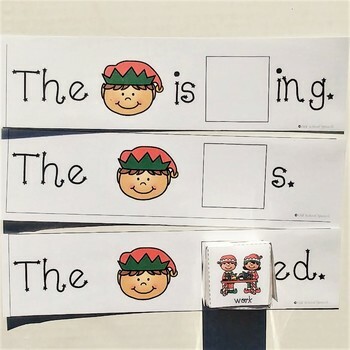 8 pictures for sequencing plus a mat. Please use your clinical judgement: if you have students who are not able to sequence 8 pictures, present the appropriate amount. Retell using story elements. The student matches pictures with the story elements. The student can take the completed sheet home for home practice. Vocabulary Matching Worksheet. The student matches the vocabulary word to its meaning. Category Worksheet. The student places the object in the appropriate box. A carrier sentence is included. Describing Worksheets. 2 different formats to work on describing a Christmas Tree and an elf. Both may be taken home for home practice. Search & Find. The students circle or color items in the scene that have their sound. A suggested word list is included. 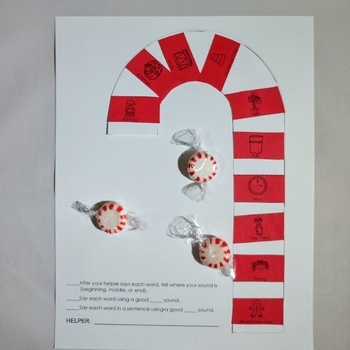 A box with the level the student is working on is also included which makes the activity ideal for home practice. Cooperative Game. Get the elf back to the North Pole with all the traps before Santa finishes his naughty list. Verb Die. 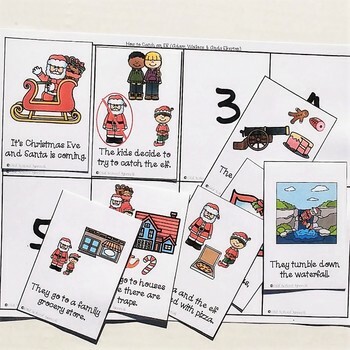 Strips for present progressive, present tense, and regular past tense. Includes color and blackline version. Instructions are included on the pages with the die. Candy Cane Craftivity. Instructions are included. Sounds included: /w/, /h/, /p,b,/, /m/, FCD, /t,d,n/, /f,v/, /k,g/, /l/, ‘sh’-’ch’-’j’, /r/, /s/, l-blends, r-blends, s-blends, categories, and blank strips for students to write target words or for pictures to be glued onto. A page is included so the craftivity can be sent home for homework. I am not affiliated with "How to Catch an Elf", Adam Wallace, Andy Elkerton, Sourcebooks, Inc., Sourcebooks Jabberwocky, or Leo Paper. ☝Don't forget to click the ⭐ to be notified of new products! ✍ Leaving feedback on all purchased items earns credits for you to use on future purchases!